Originally, I wanted to find the best vegan protein powder, so I bought 21 products, and tested them all. It wasn’t until later that it occurred to me that some people are only interested in organic protein supplements. So I made this page, focusing only on the best organic vegan protein powders. Out of the original 21, that leaves 5. I’ll go over my testing procedure, and then get right into which products scored the highest. Nutrition (Protein content) – Products are scored based on what percentage of calories come from protein. Not the most complex, but gives you a picture of the most important nutrient in a protein powder – protein. Price – How cheap is a product per 100 grams of the size closest to 2.2 lbs / 1 kg? The cheaper it is, the higher the price score. Mixability – How well does it mix? I filtered out and weighed any clumps in order to calculate a mixability score. A powder that mixes perfectly gets a perfect score of 25. Taste – How good does the shake taste? I tested them all in the same amount of almond milk, using the standards (to be consistent). Each category is out of 25, where a high score is always better. The scores are also relative to each other. So a score of 25 in a category means that it’s as good as plant-based powders get in that category. That’s a very quick overview of how I tested them, but you can see my detailed testing procedure if you’d like to see the specific formulas and procedures I used for each category. Once I calculated scores for all the products in each of the 4 categories, I could add them up to get an overall score. The overall score is an easy way to compare them against each other and see which one is truly the best. If you’d like to know more about each supplement, and why they got their overall ranking, keep going to the next section. Otherwise, here are the final results in table form. *Only the unflavored version is organic. In this section, I’ll go through the powders from best to worst and give you a detailed explanation of why it scored the numbers it did. 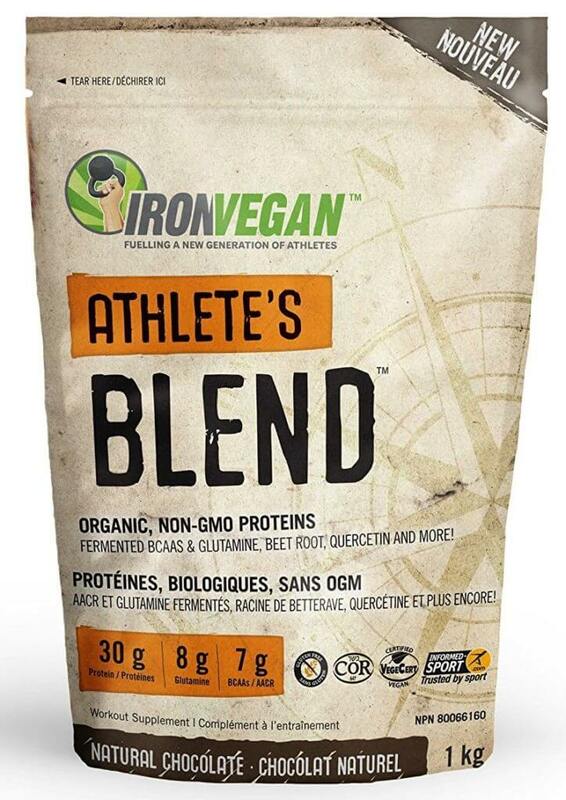 Ingredients: Organic Protein Blend (Pea Protein, Brown Rice Protein), Organic Acacia Gum, Organic Cocoa Powder, Organic Cane Sugar, Organic Guar Gum, Organic Natural Flavors, Organic Rebaudioside A (Stevia Extract), Organic Fruit and Veggie Blend, Digestive Enzyme and Probiotic Blend. I’d like to point out the digestive enzyme and probiotic blend right at the end of the list. If you’ve had stomach issues with other plant-based protein powders, Purely Inspired may work better for you. Nutrition (13/25) – The weakest part of this powder, right around average. There are 20 grams (or ~62% of calories) of protein in a scoop of 130 calories. It’s not bad, but other products have a higher protein content. 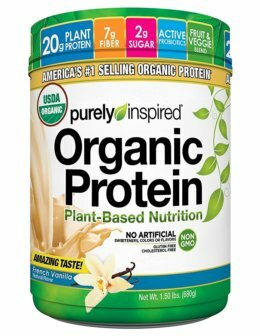 Price (22/25) – Purely Inspired is one of the cheapest vegan protein powders, let alone organic powders, which are usually more expensive. Mixability (22/25) – It mixes really well, with just a single gram of “clumps” in the shake. You’ll barely taste it. Taste (15/25) – The taste was very average. It had a bit of an aftertaste and chalky texture, and the flavor was okay. Nothing terrible, it’s still easily drinkable, it’s just not “great”. Overall, it’s the best organic vegan protein powder that I’ve tried. If you’d like even more detail on these scores (and pictures), see my full Purely Inspired Organic Protein review. Optimum Nutrition (ON) is arguably the largest and best-known supplement manufacturer for athletes. This product is relatively new, and I was able to buy a tub just after it was released. Ingredients: Plant Protein Blend (Organic Pea Protein, Organic Brown Rice Protein, Organic Sacha Inchi Protein), Natural Flavor, AncienTrim Organic Grain Blend (Organic Amaranth, Organic Quinoa, Organic Buckwheat, Organic Millet, Organic Chia), Organic Cinnamon Powder, Organic Stevia Leaf Extract, Organic Guar Gum, Xanthan Gum, Ascorbic Acid, Organic Gum Arabic, Salt, Organic Pomegranate Powder, Cyanocobalamin. Nothing special to note other than it’s a very long list. Lots of grains and thickeners (gums). Nutrition (15/25) – ON has 24 grams of protein and 150 calories per scoop. That’s 52 calories coming from other sources (carbohydrates – 7 grams). Price (13/25) – Right in the middle. Not cheap, but not expensive either. Mixability (22/25) – Mixes really well, just a gram of wet clumps after following my mixing test. Taste (15/25) – Drinkable, but not great. It had a very “grainy” texture, and also a significant aftertaste. 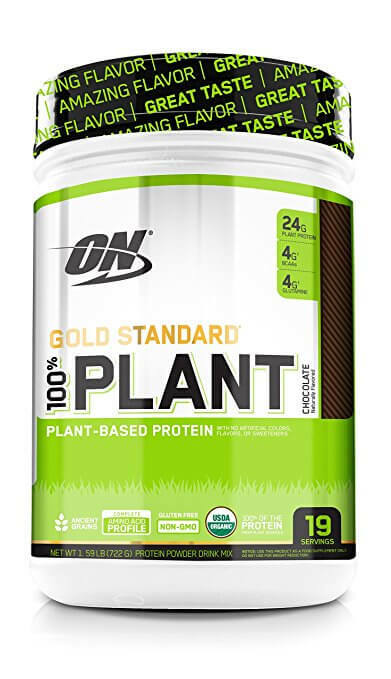 For even more detail, see my Optimum Nutrition Gold Standard Plant Protein review. Orgain turns out to be a great choice if you’re looking for more of a general meal replacement shake, rather than a pure protein shake. Ingredients: Organic Pea Protein, Organic Brown Rice Protein, Organic Chia Seed, Organic Hemp Protein, Organic Acacia Gum, Organic High Oleic Sunflower Oil, Organic Inulin, Organic Rice Dextrins, Organic Rice Bran Extract, Organic Erythritol, Organic Natural Flavors, Organic Alkalized Cocoa, Sea Salt, Natural Flavor, Organic Acacia Gum, Organic Stevia, Organic Guar Gum, Xanthan Gum. Nutrition (8/25) – The real weakness of this product. It has 21 grams of protein and 160 calories per shake (the rest is mainly carbohydrate). More calories means more filling, making it a decent light “meal” in a pinch. Price (16/25) – Orgain is a little bit cheaper than average. Mixability (25/25) – This was the best mixing organic powder I tried. It mixed perfectly, with no clumping at all. Taste (15/25) – The flavor is actually good, but the texture is very chalky, and there’s a decent bit of an aftertaste. 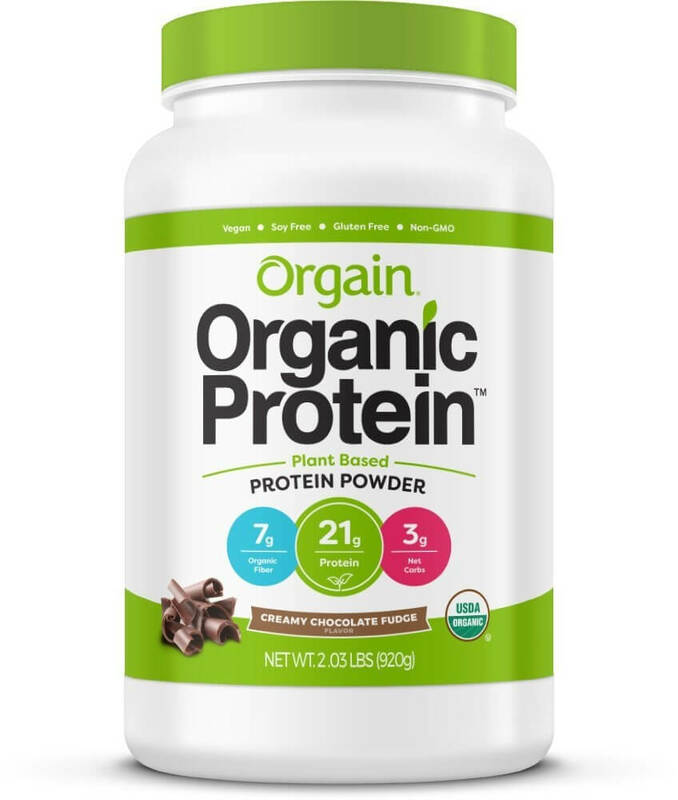 See my full Orgain Organic Protein Powder review here. 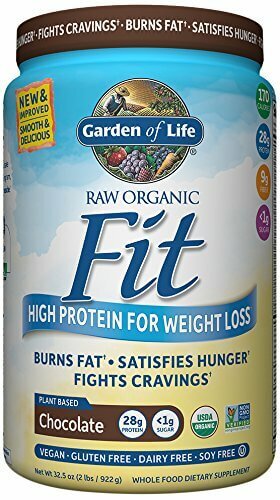 Garden of Life is not only an organic protein powder, but it’s also raw. Ingredients: Organic Pea Protein, Organic Sprouted Brown Rice Protein, Organic Tapioca Fiber, Organic Chia Seed & Sprout, Organic Flax Seed & Sprout, Organic Cracked-Wall Chlorella, Organic Amaranth Sprout, Organic Quinoa Sprout, Organic Millet Sprout, Organic Buckwheat Sprout, Organic Garbanzo Bean Sprout, Organic Lentil Sprout, Organic Adzuki Bean Sprout, Organic Sunflower Seed Sprout, Organic Pumkin Seed Sprout, Organic Sesame Sprout, Organic Stevol, Organic Ashwagandha, Raw Probiotic & Enzyme Blend. Note that the overall score is only 53 out of 100, so it’s not exactly one of the highest ranked protein powders overall (for reference, the #1 non-organic protein scored 86). Here’s how the score breaks down. Nutrition (16/25) – 28 grams of protein and 170 calories per scoop. Just about average for plant-based powders. Price (16/25) – A little bit on the cheaper side, but there are others that are cheaper. Mixability (6/25) – It mixed really poorly, with tons of clumps. Taste (15/25) – Incredibly chalky, even with the clumps removed. Other than that, good flavor and no aftertaste. Keep in mind that when I did the taste rating, I filtered out the clumps. Normally, I think it’d be a little hard to drink. Here’s my full Garden of Life Raw Fit review. This is a protein powder that’s only available in Canada. I saw it at a local Popeye’s supplement store, and figured I might as well give it a try. Ingredients: Organic Sprouted Brown Rice Protein, Organic Fermented Pea Protein Isolate, Vegan Fermented L-Glutamine, Vegan Fermented L-Leucine, Vegan Fermented L-Isoleucine, Vegan Fermented L-Valine, Taurine, Beet Root, Quercetin(e), Zinc, Organic Fair Trade Cocoa, Organic Chocolate and Vanilla Flavours, Apple Pectin, Xanthan Gum, Organic Stevia Leaf Extract, Sea Salt. Nutrition (14/25) – 30 grams of protein and 190 calories per scoop. So a very high protein amount, but also high amount of calories. It’s right around average when it comes to protein content as a percent. Price (7/25) – It was very expensive compared to most alternatives. Mixability (19/25) – It mixed quite well, but there were a few grams of clumps. Not a deal breaker, but you’ll taste them a few times per shake. Taste (5/25) – Here’s the biggest issue. It has a slimy texture and strong aftertaste. I managed to drink it, but it was a struggle, and I’m not sure if I’ll ever be able to finish the rest of the bag. You can see my Iron Vegan Protein review for more specifics. Why is this a bonus? Well, technically it’s not an organic powder. In fact, the chocolate and vanilla versions are NOT organic. However, the unflavored one, which is the one I tested, actually is. Ingredients: Pure, organic Pea Protein Isolate [from yellow peas (Pisum sativum) (Non-GMO)]. One single ingredient, pea protein isolate, that happens to be organic. This was also one of the highest scoring protein powders overall. So I think it’s a great option for many reading this post. Nutrition (25/25) – It’s pure protein isolate, so the protein content is of course high. It has 24 grams of protein per 120 calories. 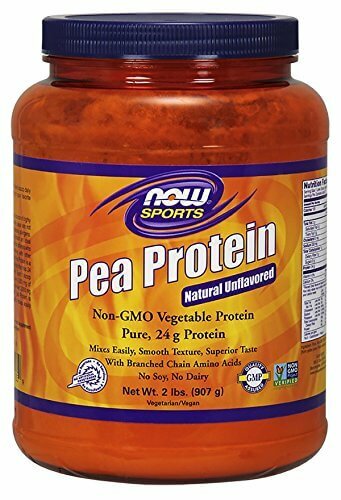 Price (23/25) – NOW Sports is the cheapest vegan protein powder you’ll find unless you find a great sale. Mixability (19/25) – It mixes well, but not perfectly. There were 2 grams of clumps left after mixing. Taste (15/25) – The taste is nothing special (keep in mind it’s unflavored). No aftertaste, but quite chalky. It’s drinkable without too much effort though. I highly recommend this especially if you’ll be blending it into a smoothie, where the fact that it’s unflavored won’t matter. The price and protein content are as good as you’re going to find. Here’s my full NOW Sports pea protein review. Hopefully all this testing was useful to you. One thing I need to point out is that there are a few other organic vegan protein powders out there, I just haven’t tried them yet. If you’re really set on an organic powder, and none of the ones on this page appeal to you, keep looking. There’s a chance that you’ll find something better for you. What’s the Vegan Alternative to the GOMAD Diet?